Get cast on Jessie or see the taping live in the studio audience! 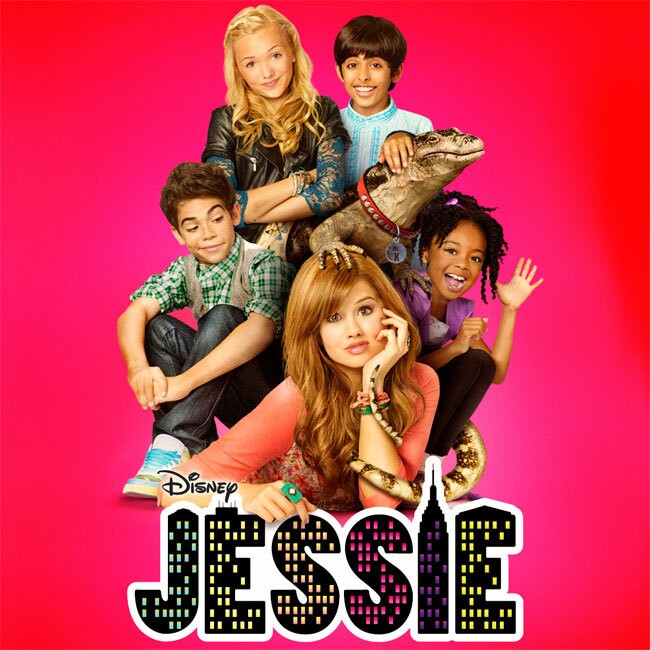 Jessie is a new Disney Channel show that premiered in September of 2011 and will hopefully run through 2014 and 2015. The series follows the life of a teen girl, Jessie, a nanny to a very large, rich and diverse family. She is the oldest of the kids in the cast. The rest of the cast varies in age. Jessie O’Keefe, an 18-year-old small town girl with big dreams who, rebelling against her strict father, a Marine Sergeant, decides to leave the military base in Texas where she grew up and moves to New York City. She accepts a job as a nanny and moves into a multi-million dollar penthouse apartment on the Upper East Side with the wealthy Ross family which includes jet-setting parents, Morgan and Christina, and their four rambunctious children; Emma, Luke, Ravi and Zuri, along with the family’s pet, a seven-foot monitor lizard. Luke Ross (Cameron Boyce) – 12-year-old boy adopted at the age of five from Detroit who has a passion for video games and dancing. Ravi Ross (Karan Brar) – 10-year-old boy from India and the newest adoptee to join the Ross family. Zuri Ross (Skai Jackson) – 7-year-old girl, adopted at birth from Africa. Christina Ross (Christina Moore) – mother to the four Ross children and a former supermodel turned business magnate. Mr. Kipling (Frank) – a seven-foot Asian water monitor lizard. Do you want tickets to a live taping of ‘Jessie‘? The Disney Channel films ‘Jessie’ in front of a live audience and tickets are free. Disney / Marvel TV show "The Defenders"
Hello my name is Sarah and I would love to be apart of the Disney channel show Jessie. It would be an honor. I am 15 years old I am around 5’9. I have light brown hair and blue/green eyes. Hair Type nappy Skin Color tan Full Name Angel Marie Collins Born June 14 2005 Weight 40 pounds Traits: nice, sassy, respectful, truthful, and most important a caring person. Hello my name is Serena. I’m 11 years old. I live in Ireland. I’m good fun and love a good laugh all the time. I would love the part because I’m very good in acting, singing, dancing, writing poem’s, drawing and cooking. I can speak English, French and Irish. Getting a part would be a dream come true. It was always my dream the be a successful actress, so I hope that this message could change my life. Hi my name is Camryn. I’m 10 years old and I’m a big fan of Jessie and all of you guys. The cast just makes me laugh and I enjoy making other people laugh. I just want to be apart of it, it’s my dream so contact me but please let me audition. If you let me, I promise I will surprise you. Eye color:hazel, Acting experiences: I’ve been in drama for 2 years and I joined forensics this year. Age:12, my birthday is January 16th. I love Jessie and Disney channel. Please email me if I get the audition! Please email me! Hi i’m Emma. I am 11 and I can do many accents. I am a huge fan of the show. I have a love for acting and I am seriously just like zuri. I hope you will give a chance. Hi! My name is Alexa, I am 12, I am a singer and actress and love the show! I am American but can also have a British accent. Please give me a chance to shine. I love the show and I would love to be on it. I am an acter and I’m 11. Would love to have a chance to act on the show. Hi my name is Brittany Manning and I am 10 years old. I am in 5th grade, the country that I am from is Jamaica and I am a female. My name is Jamequa and I would really truly love to be on Jessie because from the first time I watched it, I’ve been watching them over and over again. I am just bleeding for this. I would do any thing. I just want to meet you for the first time. I even dream about it, so please, and if you pick me I can finally prove to my cousin that any one can act if they believe plus I love to be girly and also boyish. I can sing and act but I never went on stage before. I would be broken-down if I don’t get that. I would learn and listen to you all. I am 10 years old and I love fashion, glitter and to make everything pretty. Let me learn from each of you. I would do anything to get a role on Jessie. Also, I can sing really really well. I would not be disobedient. Getting a role on Jessie would be my Christmas present. Hi, My name is Amy Diack. I’m an actress, singer and artist. I’m a 16 year old South African. I have black hair, dark brown eyes and I’m dark skinned. I’ve been in Drama Theater so I’ve done a lot of plays. And I’m also a singer and artist. A lot of haters think I’m not capable of being on Disney Channel but I know they’re wrong. I have what it takes to be on Jessie because it’s a dream I’m not willing to give up. Hello everyone, my name iskiara buxand, I am 11 years old. Please give me a part on Jessie as it will make my year. I am really dedicated so you will not regret this, please email me if I got the part. I do have a bit of acting experience so please pick me, sincerely kiara. Dear disney people, please give mea part on Jessie. If you go to your other pages you will see me there. I really wanna be on tv. It will save my family from going bankrupt. Please choose me as I am really dedicated, sincerely kiara. My name is JaMiracle Daniel. I’m an 11 years old. I make all A’s in school. I love being in pageants, modeling and acting. I would love to get my chance to work with Disney Channel Stars. Hi my name is Mia, I am 11 years old and I’m in sixth grade. I go to Freeport middle school. I like to act and model for my mom. She thought me when I was little, that’s how I learned and my mom signed me up for modeling and they called me back but we couldn’t make it…. so I would love another chance at stardom. Hi, i am Esther, I love to act and dance, it is in my soul. I love to make people laugh for it is the Best medicine. I am not in this for popularity, I would love to be cast on Jessie. I would love it if I was accepted. Hi, my name is Anant and I think I could play Ravi’s brother who gets adopted from India because even though I’m born in America, I can speak in an Indian accent, naturally so I would love to be in this show. We are 4’6 our weight 70 lbs. We live in Huntgintown Maryland. Hobbies: Reading,Singing,Chorus,Piano,Girl Scouts,both on us are on the SMAC swim team and CSA Travel Soccer team. I hope I will be on this show. I love to dance and sing so I hope I make this part. Hi my name is jayden Bagley. I am now a wide receiver for the Seahawks. MY cousin Kevin Durant would love for me to be on a tv show. Hi my name is Alicia. I am 12 years old. I’ve always dreamed of being on Jessie! And now’s my chance! I love to act and sing! I sure would love an audition for Jessie. I believe I can do anything if I try my best and believe! So, I thought I could try to get an audition. Please get back to me! If you don’t, I totally understand, but please, I would really appreciate it! I really LOVE Jessie! Acting is my everything, it is a dream come true. LOVE YOU JESSIE YEAH !!! I may only be 8, but great things come in small packages and I have a huge personality for my height and weight. I also have a huge dream just like Jessie. I am a mix, my dad is Hispanic and my mom is White, Ricky and Lucy to the max- so I have light brown hair, dark brown eyes, and light brown skin. I’m a little short and very athletic. I’m quick witted and love to dance, sing and laugh. You may or may not enjoy watching, but you wont know if you don’t give me a call. 16 yrs old special needs, love Jessie. Have a crazy crazy laugh that is infectious and causes others to crack up. I may only be 8 but great things come in small packages and I have a huge personality and a big dream just like Jessie! I’m a mix, my dad is Hispanic and my mom is white- Ricky and Lucy to the max, so I have light brown skin, long brown hair that curls and brown eyes, but I got my moms big teeth, ha! I’m a little short and very athletic, I’ve also been told I’m quick whitted and fabulously funny. I am Elizabeth McCorvey and I am 10 years old. I am African American. I live in fort worth, Texas and I love Disney channel. I have been acting since I was 7 years old. I have acted in plays at church and school and I just love to act with my friends. I have been singing since I was 5 years old in school plays, musicals and at church. This is my second time saying all of this lol because I really want to be on Disney channel so much. Acting and singing is my life and to be on Disney channel would take my acting and singing skills higher. If my Papa was alive and I got to be on Disney channel, he would have been so proud of me. I hope I get this role and I love Disney channel. Hi, I want to audition for Jessie so badly. When you guys send back a letter to me. send the letter to flora, Mississippi and put it in the mailbox in the flora post office. I’m turning 14 years old this fall. School is coming up. I wanna know if I’m in or not. Can you send mail for me this weekend. But I have school this August. Call my phone number and ask my parents for permission. I really want to audition. I called the studios and they didn’t answer my question. I told them I wanna talk to Debby Ryan. Please, I wanna go to Hollywood Center Studios this month and audition. Hey guys I am abck with another comment and I wanted to ask you if you think I am ready to be on your show because I have been posting comments your other site telling you about how my acting is going and I am just wondering if you think I am ready and also I wanted to tell you guys that I love your show. I really hope someday I can be a part of it someday, thanks it would mean a lot. Look: Brown eyes and hair, chubby, 4’9 tall. Attitude: Strong but nice with peers. Life story: I can call my self strong. I’ve been bullied at school and in the neighborhood. But I survived. My dad left me, my sisters and mom. But please consider me even if I’m not rich. Why I want this: I want this because it’s a life time opportunity in throwing you my life and passion for success. I beg you let me get this and I won’t disappoint you. I made an anti-violence speech in my community. I live in Miami Florida. Please, I’m not rich, so I can’t go to L.A but please let me blow your mind. I won’t disappoint you. Thank you for your kindness. Hi, I would love to be on Jessie. I watch Jessie every single day and I have watched every single episode. I would love to get a part in Jessie. Because I enjoy acting, I am a great memorizer too. I work very well with others. I would love to act, its being my dream since I was 3. Please contact me, if I could ever have a chance, you would make my life easy. I want to be on Jessie because I want my family to see me on TV and I want you guys to be my friends on Jessie. I want to be on Jessie because I want my family to see me on TV. my name is Kamiyah Smith and would love to be on Jessie. I have always wanted to be a movie star and it would be an honor. I am really sweet, nice, kind, truthful, respectful and reliable. I am also a really caring person. I forgot one detail, I’m 10. I fogot, one other detail, I love to sing. Hi, my name is Anastasia and I am 12 years old. I am very good, talented and a passionate actress. I love acting, singing, dancing and working with other people. I think I am as passionate about this audition as you can be and I don’t want it for the money or the fame, I purely want it to be able to act, and perhaps to see others appreciating my joy for acting. I am a very good singer and I love dancing, I really want that audition and I tell you I am perfect for it in many ways, I have things in common with the actors already on Jessie. e. g Debby Ryan and me both speak German. Peyton and me both like fashion… Please, please can you give me this auditions. Because I love acting and I want everybody to see my passion on the best TV show ever. Jessie!!! Hi, my name is pobj, I think I should be considered for this part in jessie because I have loved jessie ever since it started. I also have loved acting. I am very passionate for acting. I have been in many plays at many theaters around California. I am a male and I live in Santa Clara, CA. Also, I am eleven and I think I would be totally perfect for this role because I work very hard on anything, even though I am looking for my big break, I still am a very good actor. My nationality is Indian and I was born in India also I can do many accents which is my extra talent. I hope you like my response to why I should be in this role. I would love to be on your show and it would make me really happy. I live really close to your casting area and I love this show Jessie . I would also love just meeting you if not on the show. Oh I am an 11 year old girl with black hair and I love your show. hey my names McKenna, I’m 13 years old and I have brown hair. I have had a dream of becoming a actress/singer ever since I was a little girl. There has never been a time that I never said I was gonna give up. I know how to sing A Capella and I have 4 songs down they are Beam me up, Count on me, Tim McGraw, and Part of your world. If you want a girl who can sing and wants to make albums, and a girl who wants her own tv show and movies to be in, you have found the right girl!! so contact me anytime, I’m ready to start living my dream !! Hi I’m Brianna Im from california and I have wanted an acting job for a long time, please contact me its my dream to audition for Jessie the tv show. My name is Kaelyn Pannier and I would love to be on the show, it would be truly an honor. Traits: respectful, friendly, reliable, truthful, most importantly I am a caring person. I have been on the basketball team, cheer-leading team, band, and softball. I would be really good for your show. I’ve been trying so hard and praying that one day I would be on Disney Channel. I hope this day will come soon!!! Jessie is my favorite show and if I get on it I can save my family from going broke and I want to get my first friends on there also. My name is Brittany Mallett and I would love to be on the show, it would be truly an honor. Traits:respectful, friendly, reliable, truthful, most importantly I am a caring person. I have been on the basketball team, cheer-leading team, marching band.